Linset is an Evil Twin Attack Hacking Tool with everything built in (multi-lingual web page, DHCP, DNS server with redirect fake AP etc) so it has a bunch of dependencies, and it’s in Spanish. But other than that, it’s pretty cool. It’s also a recursive acronym – Linset Is Not a Social Enginering Tool. There are some other cool Evil Twin tools like Infernal Twin – Automatic Wifi Hacking Tool and the protection tool EvilAP Defender – Detect Evil Twin Attacks. It deauthentificate all users of the network, hoping to connect to FakeAP and enter the password. 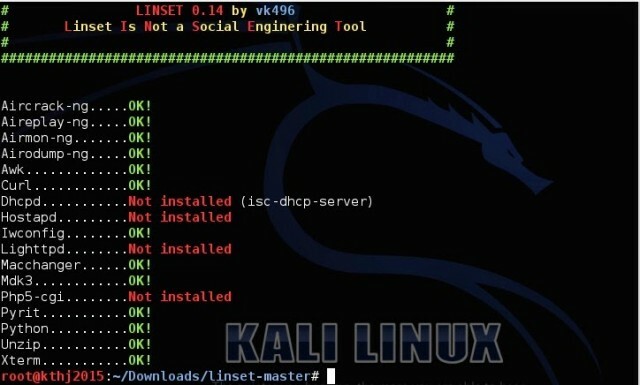 Any standard Linux install will have quite a number, something like Kali will have even more but most likely you’ll need to install DHCPd, HostAPd, LigHTTPd and PHP5-cgi. Will linset work if i dont have any external network adapters? Thanks!